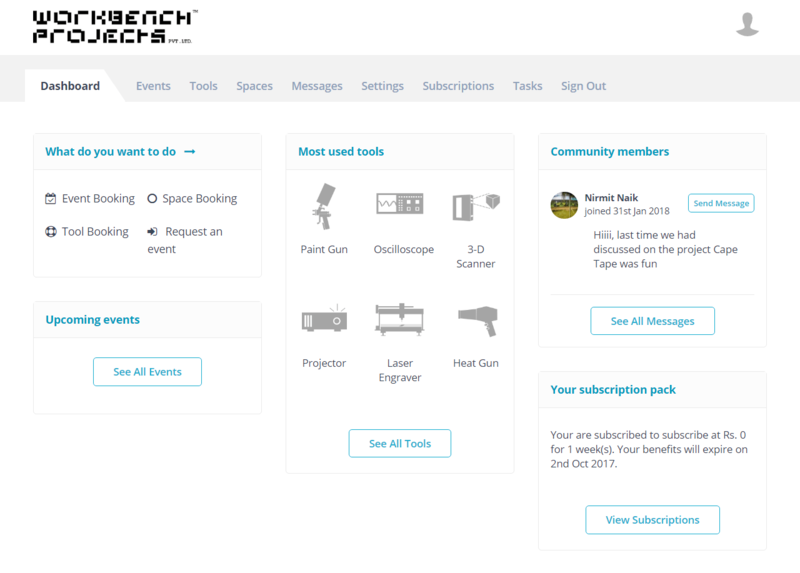 Workbench Projects is a 5000 sq. 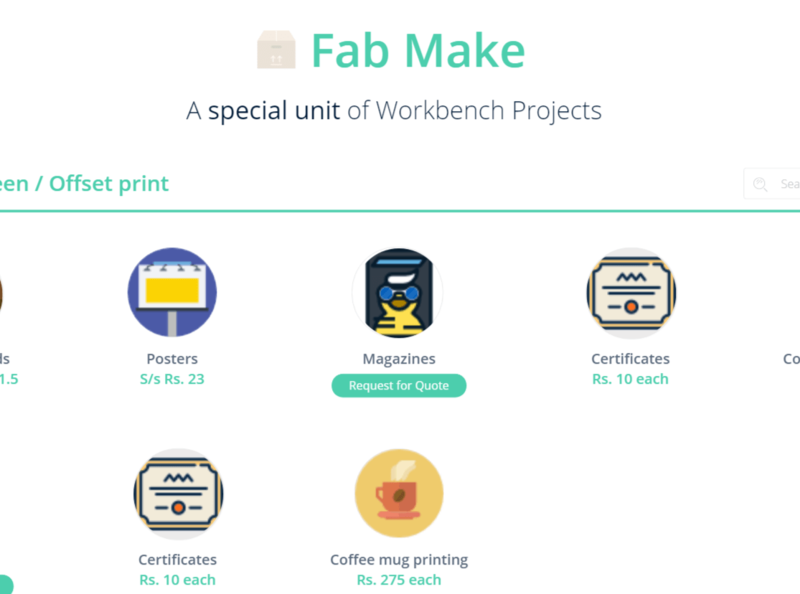 ft. makerspace in Bangalore aiming to create an ecosystem for makers where the focus is on not just tinkering and making but a space that advocates research and responsible innovation. 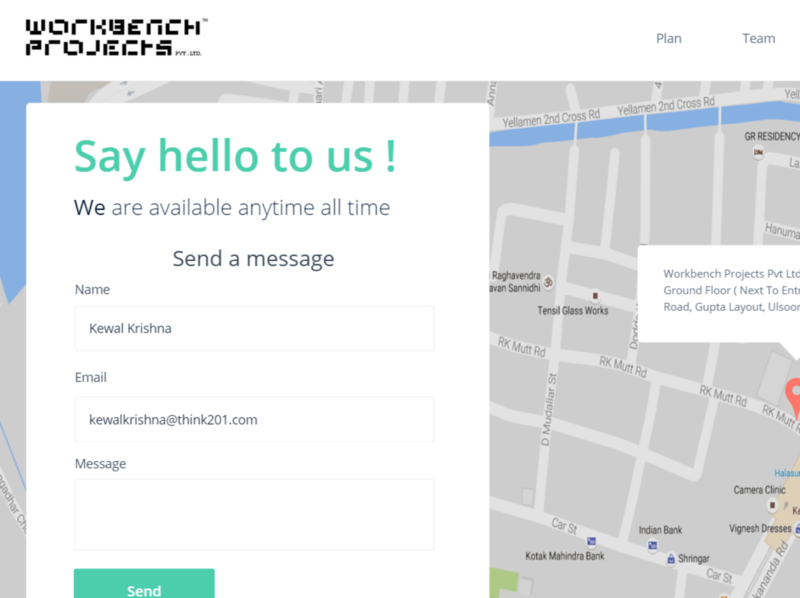 Workbench allows anyone who has a thirst to build prototypes be it software or hardware, tech or non-tech from it’s resources. 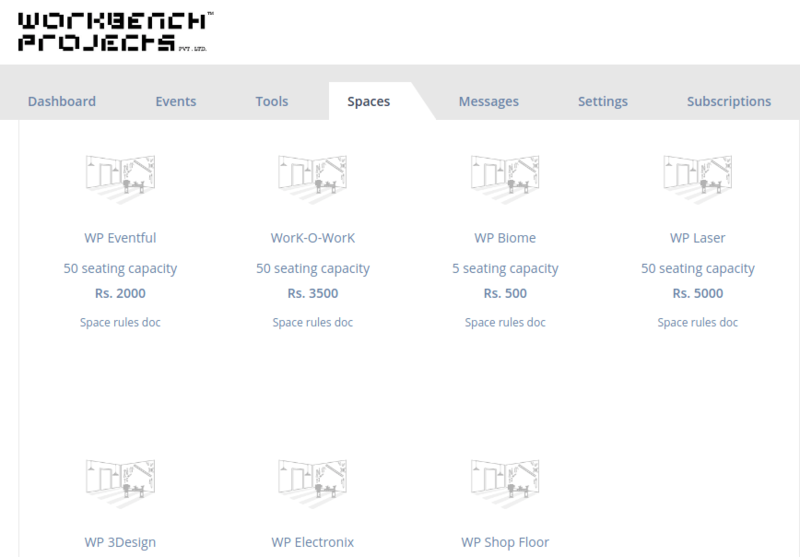 Therefore, an interface to book tools and spaces helped Workbench to avoid any booking overlaps. 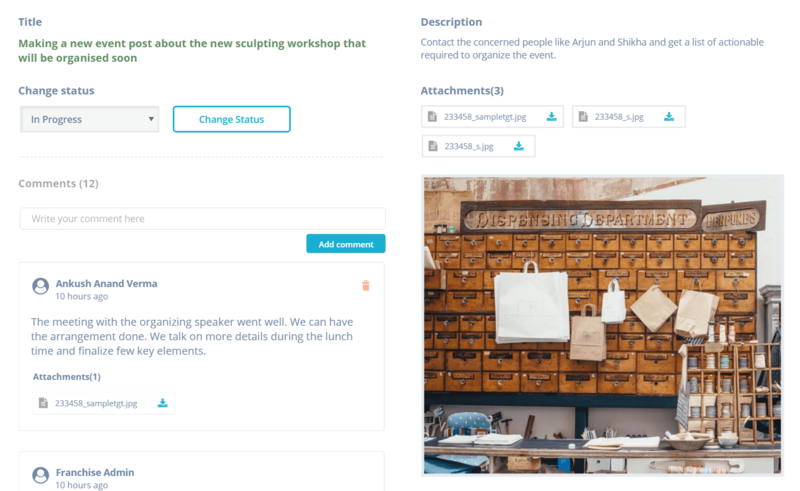 To allow more makers’ community engagement, a dedicated event module was designed and developed wherein Workbench can create events and allow users to participate in it. 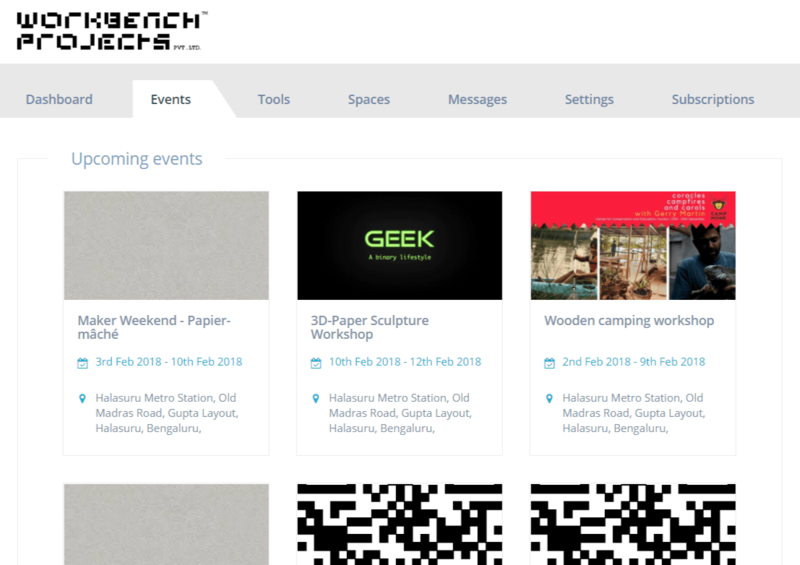 The user has lot of activities to engage with the platform after logging in such as participate in an event, book tools, book a space and so on. 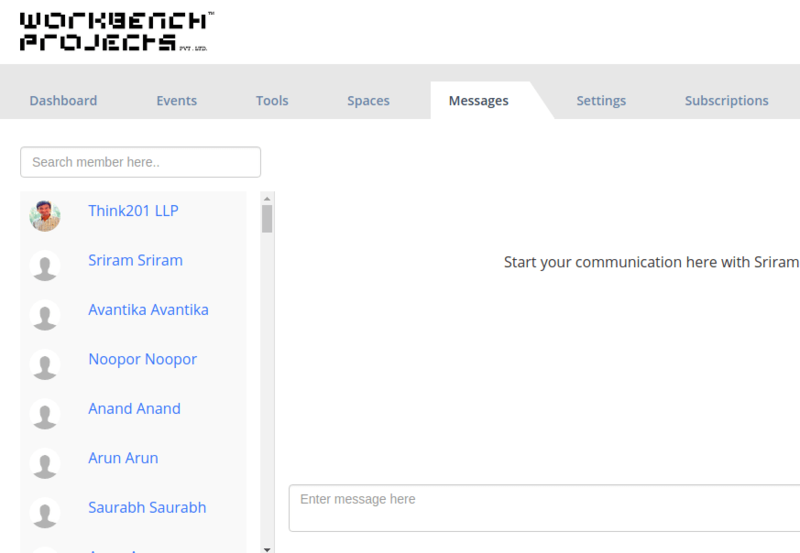 A dashboard would allow quick navigation to all the key features of the platform. 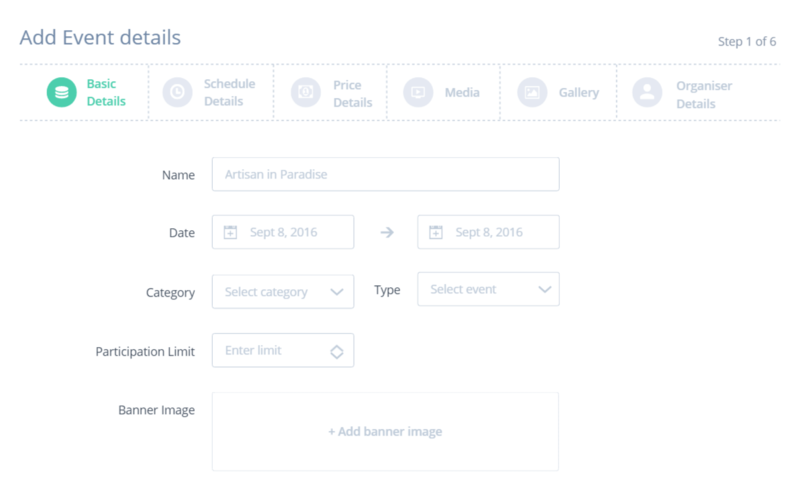 Users can view the listing of all the upcoming events and can enroll for it either for free, if the event doesn’t have any enrollment fee, or by paying the fee through a payment gateway. These events are created by the Franchise admin who can also manage the enrolled members in the Franchise Admin interface. All the tools Workbench has to provide for tinkering is listed here with all the important information. 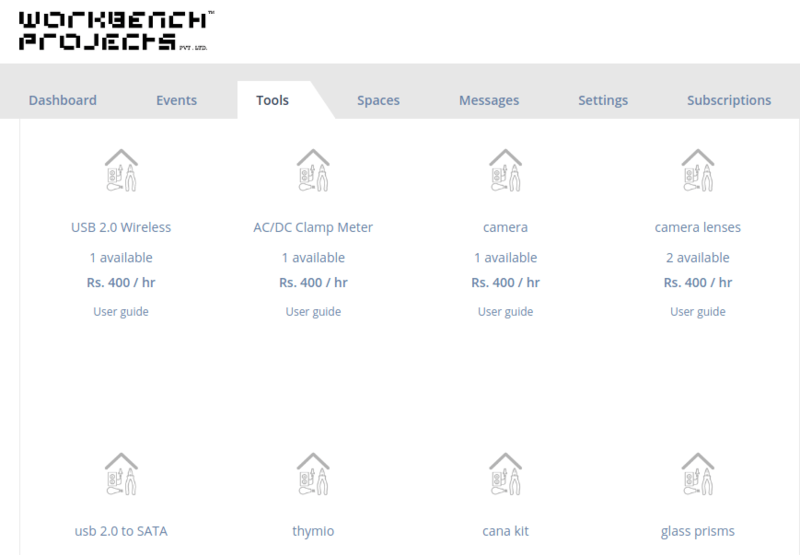 These tools are booked for the available slots. 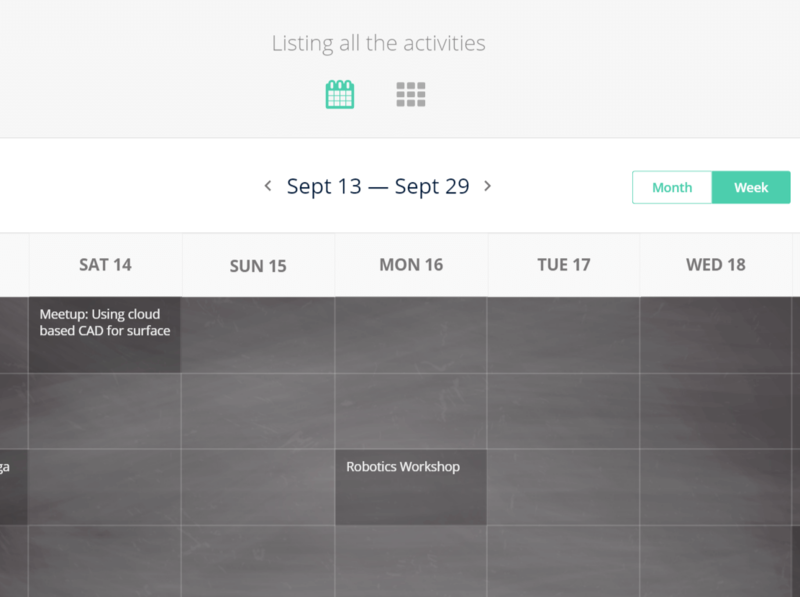 If the slots are taken, the dates are greyed out for the user to select new available slot. The Franchise admin can add tools and all the relevant informations such as name of the tool, price/hour, stock, User Guide info, etc. 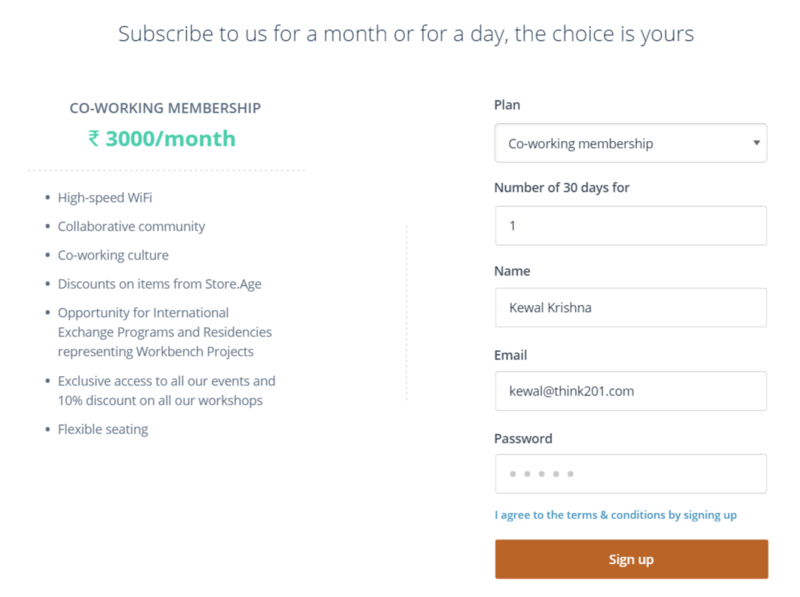 The end user can book a space for x number of people for y number of hours based on availability, which will, therefore, be priced accordingly. The space, here, means Laser cutting space, CNC space, etc. 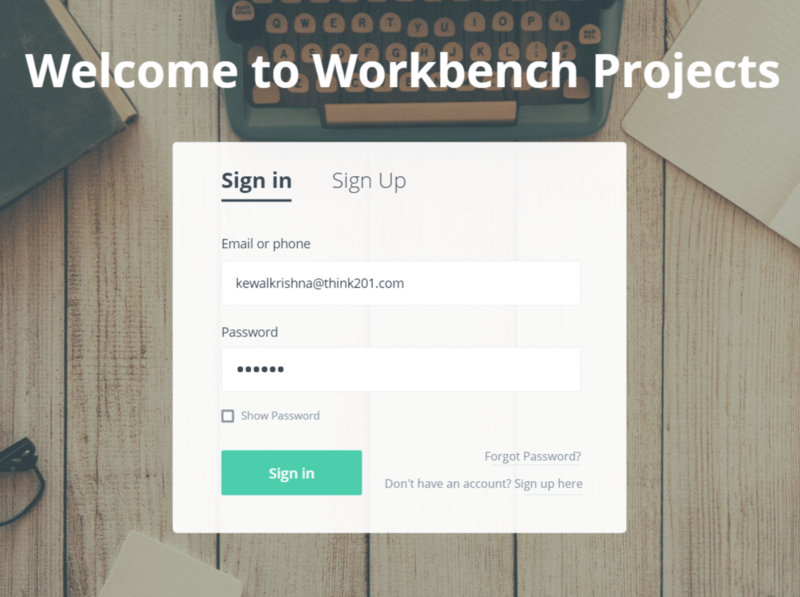 The logged in users can communicate and coordinate among the Workbench community members to always look for help and guidance or partner up on any project. 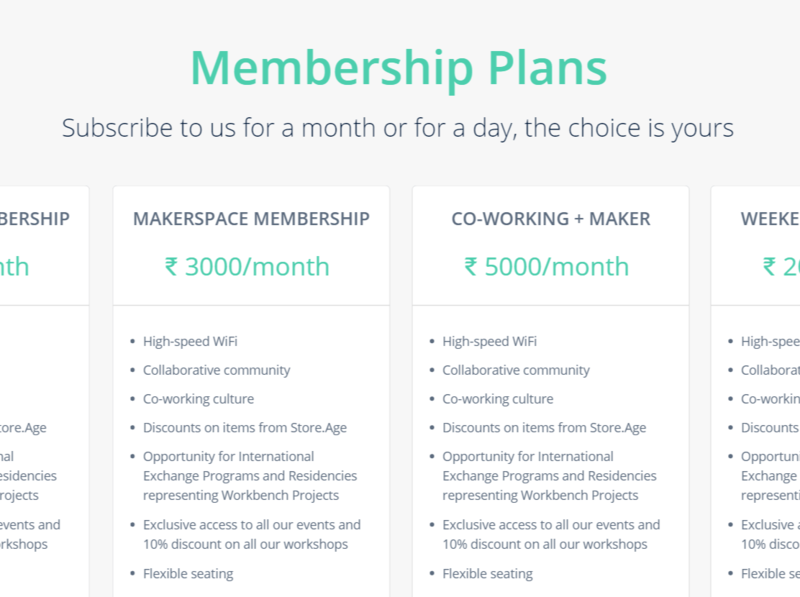 If the users are interested in purchasing a subscription among the available options that give them cost benefit over on-need booking of tools and spaces, they can subscribe to any one by making a payment through the payment gateway. Events management is an independent module allowing creation of events with all the required information about the event such as start-end date-time, venue, description, gallery, Pricing and so much more. When a team works collaboratively, it is best to distribute the work according to everyone of our strengths. 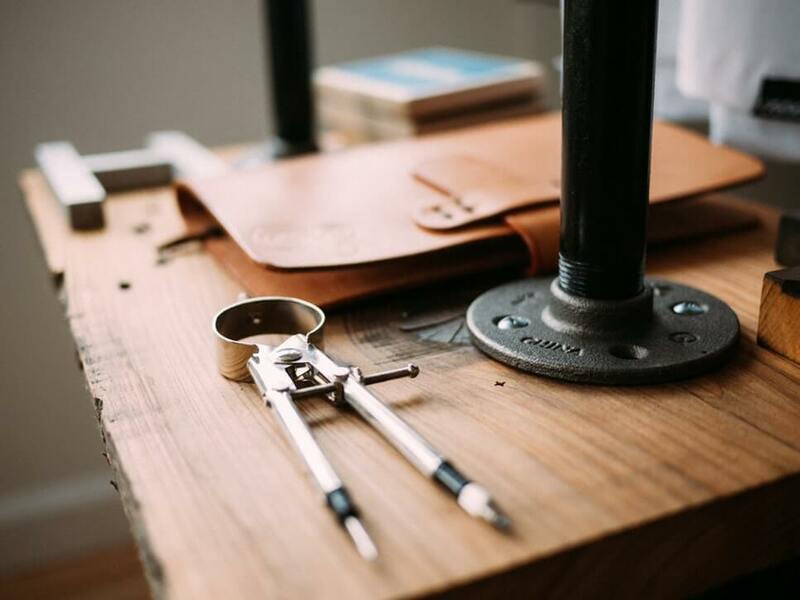 For the effective team collaboration, a task management tool is built for project execution. 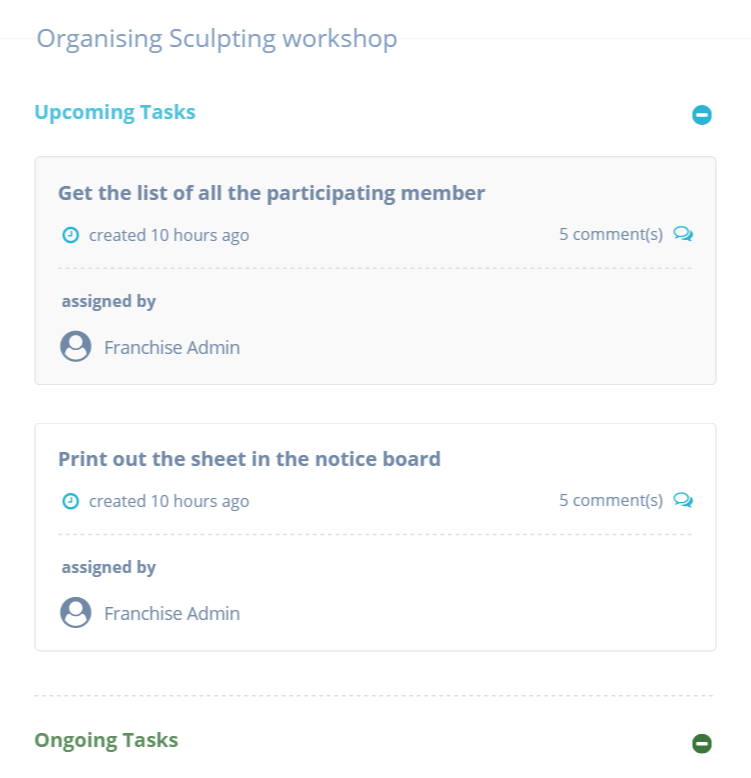 The tasks are created by Franchise Admin and are assigned to individual or a group of members. 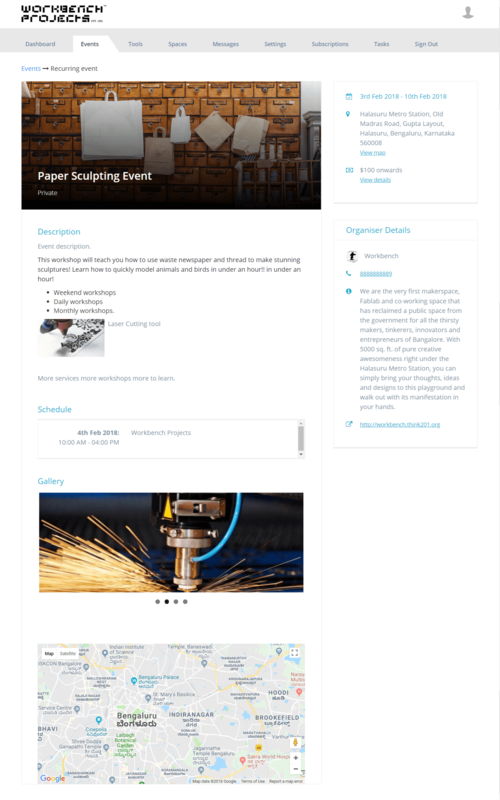 Event is created by Franchise admins to provide workshops or seminars on any topic. Franchise admin provides all the required information about the event to attract the right enthusiasts for the success of the event.